Usb led lights are very useful in Different situations. These lights are very handy and portable because they can be attached to a power source with usb port. People buy this products mainly because of 4 reasons. We can use this lights for lighting our laptop keyboard, by connecting to usb port of our laptop/Computer. This is very useful if you are living in a place where power cut is usual. We can use this as a USB Powered spotlight also. This is possible by attaching these light to a power bank or any other usb port. Usb led lights can be used us an urgent light source while travelling in car. Many of USB powered LED Lights comes with a flexible handle. After connecting to power source we can bend this in 360 degree. In darkness these lights produces enough brightness to read or type in key board. Where i can get cheap USB LED lights ? USB powered led lights are available in several online stores for cheap price. If you are living in a city you can find road side sellers selling these kind of lights. So many options are available in different colours. Xiaomi usb led light was a big hit in Indian market. Device can be connected to phone,tablets and laptops . Xiaomi led light is a bendable usb light which is available in different colours.There are some other good usb flash lights also available for computer which are listed below. This 2 piece combo pack of usb leds is available for just Rs- 111. This one is vailable in different colours and weight is 59 grams. This is one of the best selling Usb powered led lights. Available for just Rs – 50 for single piece. As good as a mini table lamp. LED lights that can be attached to mobile phones are more portable and attractive. Especially if you do not have a camera flashlight support in your phone. Buddy Selfie Flash Light is an amazing product that can be attached to mobile phone. Even if your phone have camera flash light that is not useful for taking selfie. Because you need lighting in front side of mobile phone. Buddy Selfie Flash Light can be attached to our mobile phone through audio jack. We can attach it to audio jack just like attaching headphone/earphone. Lowest price option for Buddy Selfie Flash Light is – check price. USB Powered led strips are not widely available in India. Few available options are not cheap. Onever USB Cable LED Strip in one of few options available. This usb powered led strip can be used for decoration. This comes with Adhesive tape for secure and easy application. LED Strip can be used to decorate TV, Car or background decoration. 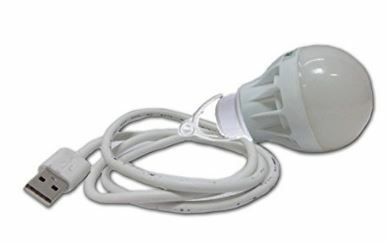 USB powered light bulb 5w (with 1.5m long cable). This one is special and different from other ones listed above. The reason is that this is a regular glob type led bulb. And looks similar to normal led bulb. But is powered by USB Source. We can use this by connecting to a laptop, computer, Power bank, Or cell phone charger adaptor. This is an awesome one without many similar products. Best for Camping or Emergency use. This along with a good power bank will do the job of an emergency light.